Provide comfort for the family of Royden Johnston with a meaningful gesture of sympathy. 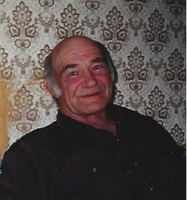 Royden "Roy" Donald Johnston Son of the late Robert and Hannah (Kauffeldt) Johnston passed peacefully into the arms of his Heavenly Father, in Hospice Renfrew with his family close to him. Roy leaves to mourn his sisters Rachel (Rick) Theale of Jacksonville, Florida; Iris (late Garnet Remus) of Peterborough; Joan Yeckobeck of Edmonton; Jean (Herb Hass) of Petawawa; his brothers Gary (Barb) of Cormac; Bryan (Beverly) of Eganville as well as his sister-in-law Doreen (late Allan "Bud" Johnston) of Quadeville. Roy is also predeceased by his brother Warren ( late Denysa); sisters, Beatrice (late Lavern Heideman); and Rita (Late Frank Gillanders). Roy was blessed with 4 generations of nieces and nephews that loved him deeply. The family cannot put into words their true gratitude that they have for everyone who cared for Roy in his final days, especially Dr. Blaine and the 2nd floor staff at RVH as well as Dorinda and Marian at Hospice Renfrew where Roy enjoyed watching the deer feed. Donations are being accepted for: HOSPICE RENFREW INC..
We encourage you to share your most beloved memories of Royden here, so that the family and other loved ones can always see it. You can upload cherished photographs, or share your favorite stories, and can even comment on those shared by others. Provide comfort for the family of Royden Donald "Roy" Johnston by sending flowers. Sincere Sympathy,Joan,Jean, and the Family.Our Prayers and Thoughts are with you....Kevin & Mary Knox. James and Uncle Roy at Helen and Geoff's trailer. 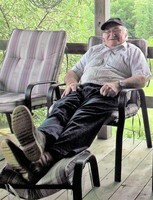 Relaxing at the homestead - Summer 2012. Listening to his sisters chat at the homestead.